Rising above social restrictions and leading the way for change in whatever way possible are actions that we casually term as gutsy. They are indeed the works of the heroes, who strive to stand against a particular form of injustice, refusing to accept it as a way of life. Their hearts do not beat indifference and their eyes are not blind to the wrongs. These heroes do not flaunt any flying capes around their shoulders; they are everywhere around us, if you care to look close enough. The man who takes the light here is the regular jeans and tee kind who will enthusiastically talk about his work that he now lives for, daring to weave bigger dreams. Korvi Rakshand is the name that calls for nothing short of admiration. Founder of JAAGO Foundation, the youth based movement that works to uplift the lives of underpriviledged children through education, 25-year-old Korvi still continues his journey that can only be described as inspiring. Graduating in LLB from University of London, Korvi was expected to take over his family business. 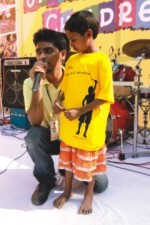 Given his constant concern over the fate of all the street children that a person growing up in Dhaka is used to seeing, it came as no surprise, however, when Korvi turned away from an already constructed career and instead, chose to use his education and skills to brave towards the beginning of rebuilding Bangladesh through breaking poverty. In April 2007, upon meeting a few friends sharing the same values, Korvi went on to set up a free of cost, English medium school in the slum area of Rayerbazar, one of the most densely populated areas of Dhaka city. “We started off with 17 children, a carpet and a whiteboard,” shares Korvi who now has a bustling school of 280 children. Korvi Rakshand, Founder Chairman of JAAGO Foundation receiving the "Mosaic International Award 2010" from Her Royal Highness Princess of Jordan Badiya bint El Hassan and Professor Yasir Suleiman, Director of Centre of Islamic Studies, Cambridge University. 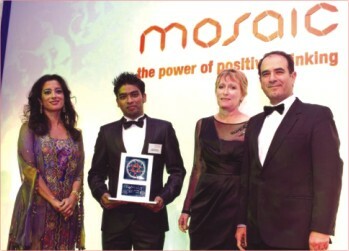 On November 23, 2010, Korvi Rakshand was awarded the Mosaic Talent Award in the International category. Mosaic, founded by The Price of Wales in 2007, aims to pay tribute to the many achievements championed by Muslims living in Britain and beyond. Mosaic operates in Bangladesh as well and of course, the news of his nomination for Mosaic International was something Korvi never expected, winning over the other two entrees, The Jordan River Foundation chaired by Queen Rania Al-Abdullah, and the Turkish journalist Yilmaz Akinci. The award recognised him for his contribution to deliver tangible benefits out of his endeavour. Today, JAAGO Foundation, an entirely voluntary movement, is a growing organisation of over 2000 volunteers, and its operations spread beyond the borders of Bangladesh. Friends of JAAGO based in UK, US, Canada and Australia, help to keep it going by opening its liaison offices in the respective countries. Grabbing a response as positive as the national front, JAAGO has surely made its presence felt internationally. With a bright smile that surely speaks of triumph, Korvi mentions the many charity shows that have been held in universities abroad. One among several, University of Toronto is organising 'A Chance for Change' towards the end of this month, including cultural shows and other activities, the proceeds of which will go towards keeping JAAGO alive and kicking. Despite all of Korvi's achievements, one has the inkling that this is only the beginning. We cannot know how far this journey will take him, but can only hope that this is not the end. At least, not yet.